Olivia lives in dresses and her little sister is no different. They make life so much easier and I am always on the lookout for comfortable ones that they can play in, move in and even nap in. I've rounded up a handful of my favorites for Fall. 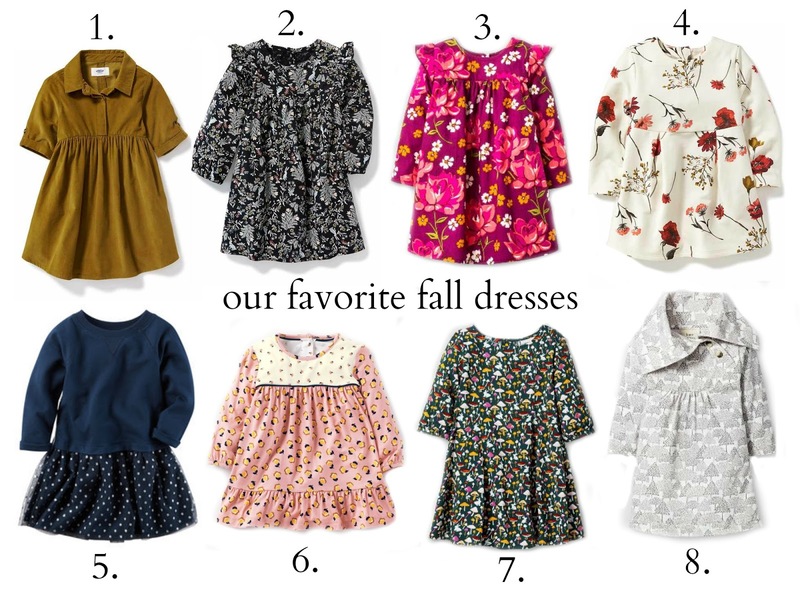 I love the mustard corduroy dress (1) for pairing with tights and boots as the temps drop and the floral fleece dress (4) looks so cozy, perfect for cooler weather. I recently ordered #3 & #7 for Poppy from Target.com. They are offering 20% off all kids clothing through 9/17 with the code KIDS at checkout, plus an additional 5% off with your RedCard and free shipping on all orders over $25. I just couldn't get over the mushroom print (7) and love all things floral, so 3 was a must have. Another favorite is the Kate Quinn Organics Dress (8) with the most darling cowl neck. It's the perfect neutral to pair with colorful accessories all season long! Love all these dresses! My little just turned 6 and can no longer squeeze into the toddler sizes. The clothes in the next sizes are just not the same. Thanks for always sharing all your fun finds!